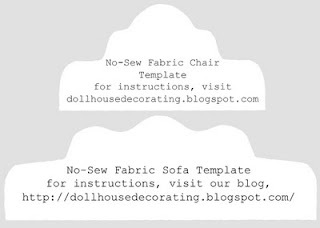 Here are the templates of the handmade no sew doll house chair / couch / sofa that I like the best so far. Follow instructions from the earlier post. To get it the correct size, copy this image and insert it in a Word editing program, resize it to 117% (Height 5.88" by Width 8.25"). This is to fit a chair block of 1.75" x 1.75" and a sofa/couch block of 4.5" x 1.75".